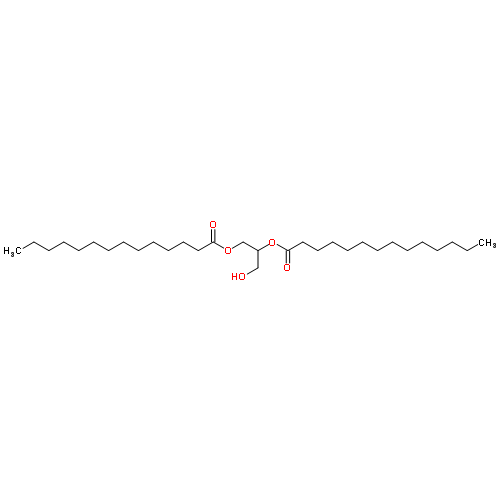 1,2-Dimyristoyl-rac-glycerol is a carboxylic ester, glycerolipid and diglyceride with an attached myristoyl group, promoting interactions between proteins and lipids. It can be employed as a detergent or reagent. It’s functional in cell biology experimentation concerning metabolism and metabolic pathways involving glycerolipids. As a diglyceride, the substance consists of two fatty acid chains covalently bonded to the glycerol molecule in the 1,2- formation. Diglyceride (DAG) research investigates the process of suppressing fat accumulation through DAG consumption. Storage/Handling: Store at room temperature. Join our list to receive promos and articles. Gold Biotechnology (U.S. Registration No 3,257,927) and Goldbio (U.S. Registration No 3,257,926) are registered trademarks of Gold Biotechnology, Inc.